Redefining ozone technology as part of the EU Gateway Business Mission to South East Asia. Jesper Kedström is on an important assignment to bring the smart Primozone ozone solutions as part of the Environment & Water Technologies business mission to Southeast Asia from March 17 until March 22 2019. Jesper appreciated relevant ozone discussions in Singapore, where the main topics as always are efficiency and future-oriented solutions. Redefining ozone installations with its benefits like modularity, direct consumption and running back up – that enables to save almost 40% on CAPEX was significantly recognised by the visitors. Now it is the time for Water Philippines at SMX Convention Center in Manila. 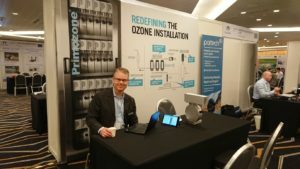 We welcome you to our booth A8, moreover do not miss the presentation “Redefining Ozone Installation” at 11.30 am on the 23rd of March, where Jesper will walk you through Primozone ozone philosophy and showcase the ways of optimising your ozone installation. Primozone – Redefining Ozone Technology. © Copyright 2017 Primozone. All Rights Reserved.